In this short guide, I will show you why you should be using Facebook Advertising to promote your online t-shirt business, I will show you how to decrease Facebook Ads cost and increase its effectiveness, and I will also show you a step-by-step guide on how to get your very first Facebook Ad up and running. Also, if what you are looking for is more of a keyword strategy for your ads you visit our Best SEO Keyword Tips for Your T-Shirt Brand. Selling T-Shirts on Facebook: Is It a Good Idea? First things first, Facebook reigns. Is this clear? If not, here’s a graph that demonstrates it. By January 2017, Facebook had 1.8 billion monthly active users. In other words, Facebook has 1.8 billion targetable users! 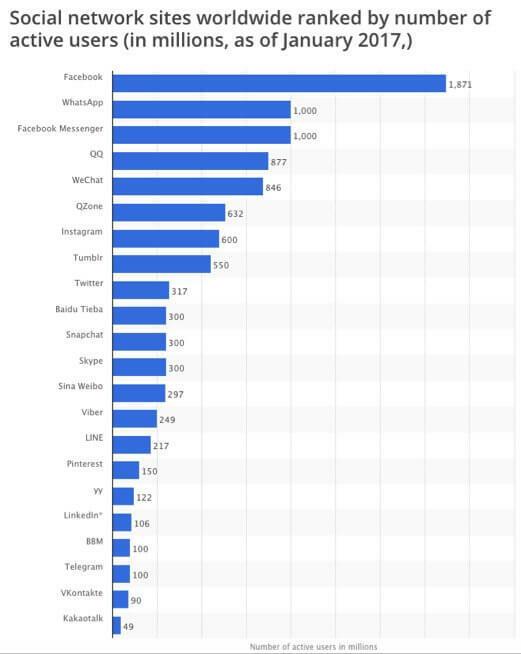 This is the main reason why advertising on Facebook makes a lot of sense and if you are still not advertising on Facebook you are definitely missing out. You might also know that Facebook’s algorithm has changed for Business Pages. By the end of 2014, Business Page’s organic reach decreased dramatically. This happened because by then, there were too many Pages and too many Page posts that were competing against many other several posts, causing posts to be rarely seen by users. To fix this, Facebook decided to change its algorithm and stop bombarding the end user with businesses’ content and started showing on the News Feed only what Facebook thought was more relevant: friends’ updates. 1. A user goes directly to their Facebook Pages Feed and sees your non-boosted post. What is the probability of this actually happening? Almost none. Very few people bother on going to their Pages Feed, do you remember the last time you checked your Pages Feed? Probably not. You can check your Pages Feed by clicking on the Pages Feed link on the left sidebar of your News Feed. You might want to bookmark the Pages Feed to stay in the know of what your liked pages are sharing. 2. 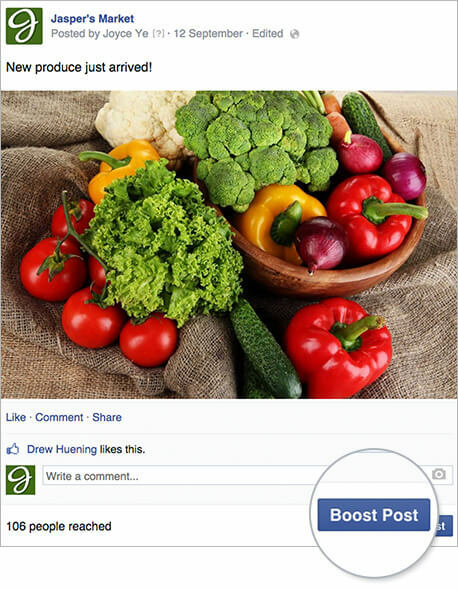 Another way a user can organically see your shared content is if they choose to “See First” your Page’s posts. 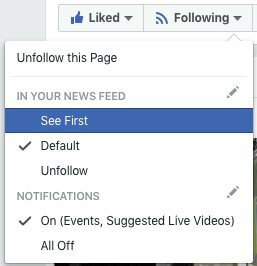 What a user has to do is go to your Facebook Business Page, then click on “Following” and choose “See First”. 3. 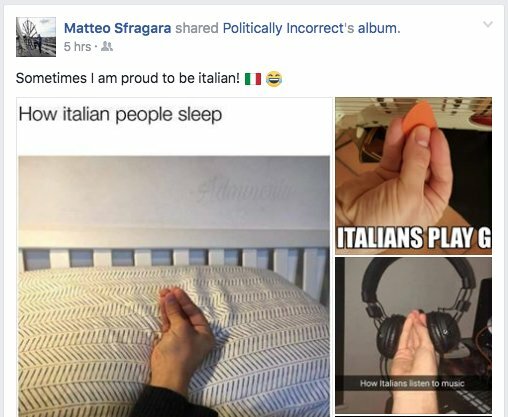 Someone decides to reshare a Page’s post on their own wall. After a piece of content has been shared on the Page, a user can share it on their wall or a friend’s wall and get Friends and Followers to see it. What is the probability of this to happen? Brand owners usually reshare content they share on their Facebook Pages to increase organic reach. Also, if the content is interesting it can get reshared and reshared, think viral posts. 4. A Facebook Page Owner boosts a post to get the post to reach its followers and an audience beyond their follower base. 5. A Facebook Page Owner goes to Facebook Ads Manager and creates an ad. Ads created through the Ads Manager perform better than a boosted post because the targeting capabilities are way higher. 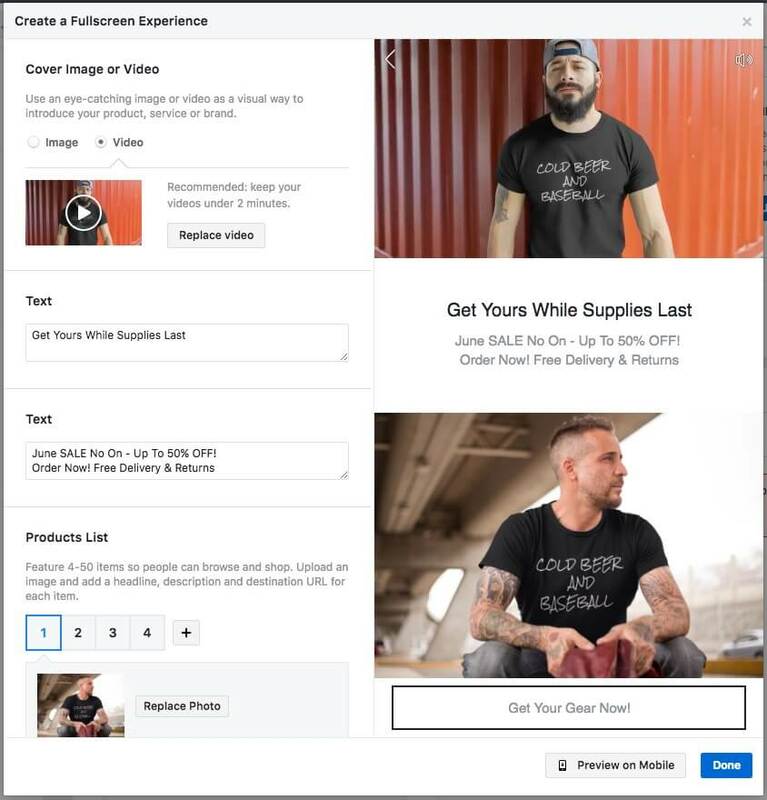 Now that we know all about Facebook Page Posts, let’s focus on points 4 and 5 since the objective of this blog post is to help you create low-cost and high-converting Facebook Ads to sell more t-shirts. So Why Are Facebook Ads Good For Selling T-shirts? Facebook ads are sponsored content that people see while they are on Facebook. And as previously stated, non-boosted Facebook Page posts have minimum visibility. On the contrary, when you invest in Ads, these can be seen on a user’s mobile or desktop News Feed, in the right column on laptops or desktop computers, or even beyond Facebook on Facebook’s Audience Network. People see sponsored content because a Page owner or Social Media Manager has decided to target them and spend money on that ad content to appear right before their eyes. Facebook Ads work because people spend on average 20 minutes per Facebook visit and what they do is they scroll through their News Feed, stop to watch, like, or comment, and continue scrolling, sometimes endlessly. Here, in the News Feed, is exactly where Facebook has strategically decided to show ads, making ads practically unmissable. Ad content may or may not go paired with social actions that your friends have taken, like liking a page. It makes sense then to think that when an ad has this extra information on it, the chances of actually doing what the ad wants you to do increases since people you know have already engaged with the page. As an example, in this Corona’s sponsored ad, I can see that 50 of my friends like Corona’s Page already so this kind of pushes me to think that Corona might be giving away interesting stuff and I should go and like this page. To begin with, Facebook page owners have started to realize that Facebook Ads is the way to go so it has also become a competitive and crowded environment. 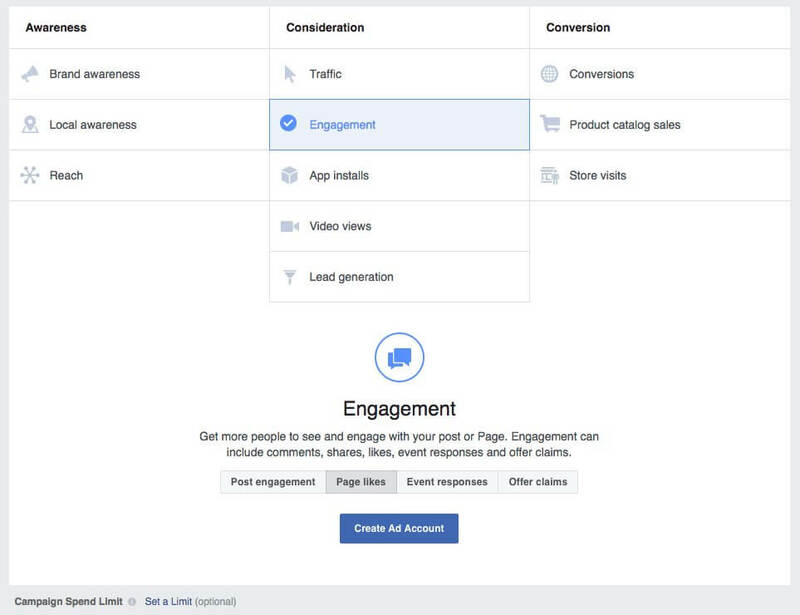 This means that your ads are competing against many other Facebook Page owners’ ads who might be creating better ads than yours, be it on the creative side, doing a better job targeting their audience more effectively, who knows. Facebook Advertising interface is so user-friendly that few actually realize that when you Advertise on Facebook you are joining a massive auction. It makes sense then to think that Facebook wants to maximize its profits and the way they will achieve this is by only displaying high-quality (relevant) ads to users so that these ads get high user engagement (money for Facebook). Alright, enough history, let’s learn the best tips and tricks about how effective Facebook ads that sell t-shirts look like. T-shirt business owners fail and end up wasting their hard earned money when they fail to define what it is that they want to achieve when investing on a Facebook Ad campaign or by boosting a post. 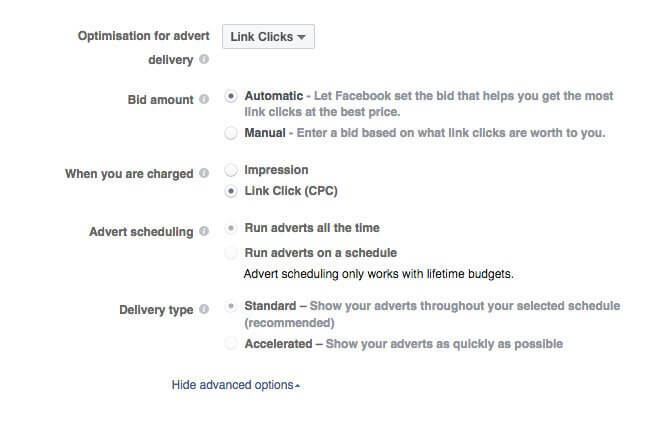 ✓ You need to know what kind of Facebook ads to run based on what your objectives are. 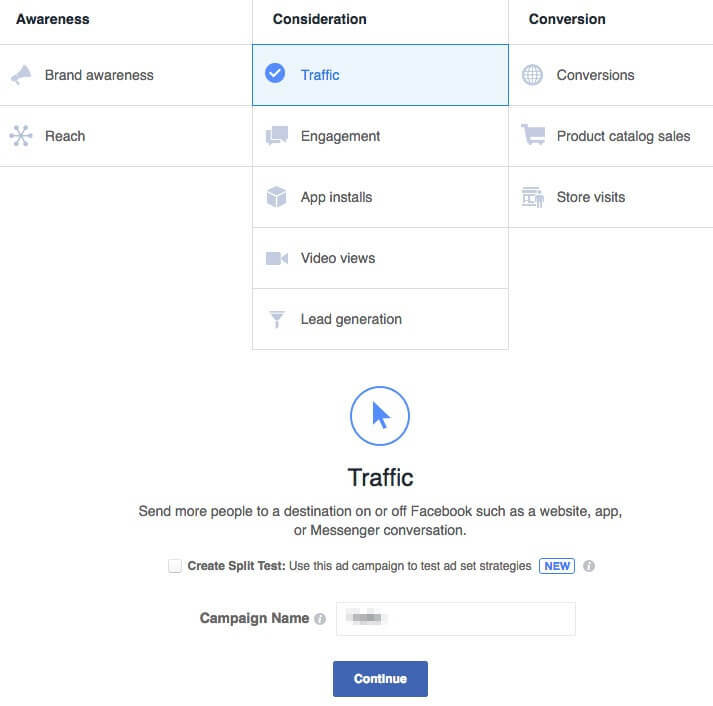 Besides achieving your campaign objectives another benefit is that you will spend less on ads since Facebook will be able to understand what your goals are and will optimize ad delivery accordingly. In this sense, what outcome would you consider a success – exposure and sales, simply sales, likes? Choosing Facebook Ad Placements the Right Way. 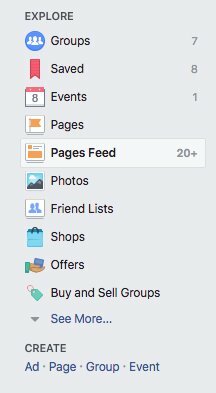 Where Do You Want Your Facebook Ads to Appear? ✓ Choose to appear on the desktop news feed or the mobile news feed only. Ads displayed on the right side column rarely get noticed. Personally, I ignore these ads, I even find them misleading, but then I’ve heard of people that purchase products that appear there, so if you feel like it, please experiment. ✓ Facebook ads work best on a CPC (Cost per Click) basis, which means that you will only pay for clicks that your ad receives. Choose to get charged per Post Engagement. 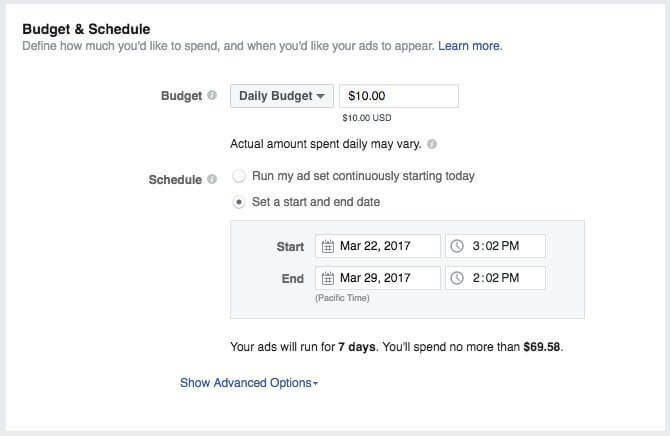 You can cap the amount of money you want to spend per day, so if you want to test ads at $7 per day, you can do it. ✓ Bidding on conversions is recommended because Facebook will do its best to deliver your ads to people who are interested in your offer also known as, most likely to convert. ✓ Make sure you target a very narrowed down niche if you want to have really inexpensive clicks. You need to know who your target market is, the things they like, watch, read, listen to, and buy. Creating consumer personas will make you an expert on psychographic and demographic targeting and will make your ads way more compelling. ✓ Build several custom audiences and improve them over time. There are advertisers that create audiences with +100 interests, wow. ✓ Go for intersections of interests. When choosing your audience interests go for “people who enjoy outdoors” AND “people who enjoy drinking beer” this is much more exact than if you were using OR instead of AND. Get the most benefit from Facebook ads and start applying this technique now. ✓ You need to know about how Facebook considers how relevant an ad is when determining which ads to show a person. The more relevant the images and the copy on your ads are for the targeted audience, the less expensive your ads will get. 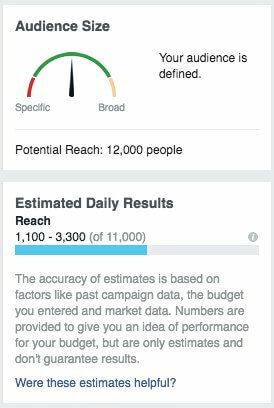 Once a campaign has ended, go to your Facebook Ads Manager then select an Ad set and under Relevance Score, you will see your ad’s score. Remember to use buyer personas to improve your Facebook Ad Relevance Score. To get the full juice on Ad Relevance Score check read this great blog post. ✓ Improve your targeting by checking Audience Insights, detect who is not engaging with your t-shirt ads and focus on the ones that are. ✓ Using High-Quality HD images, especially when in the “lifestyle” clothing business. ✓ Invest in professional product/studio photography that talks to your audience for your Ads. Placeit’s t-shirt mockups are highly recommended and super effective. ✓ Usually, people want a t-shirt that gets a reaction from their peers. So if I am passionate about X, I want to wear a shirt that someone might come up to me and say, that is cool, where did you get it. Transmit this on your ad and see how sales go up. ✓ Promote the products that you are selling on your print on demand shop through social media by engaging Facebook ads. (Not selling on a POD site yet? What are you waiting for? Head to this post on where to sell t-shirts online to find the perfect marketplace for your brand). ✓ Ask yourself, the image or video you are using will capture the viewer’s eye amongst all of the other Facebook page clutter? ✓ Carousel ads provide a flexible way to advertise your t-shirts without having to create multiple ads. 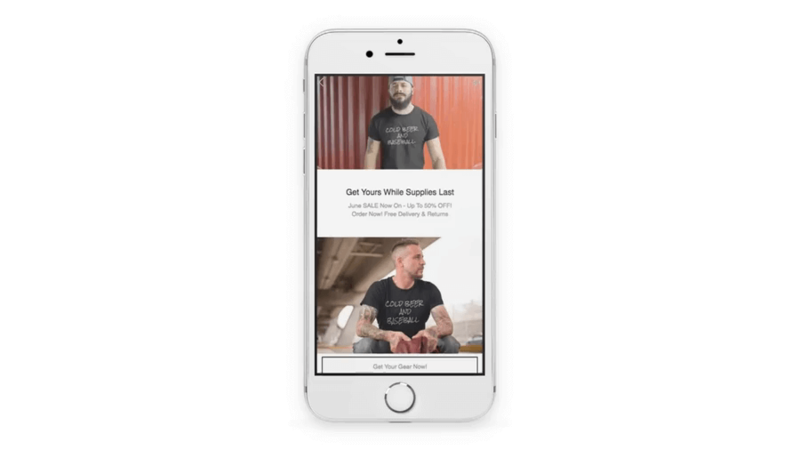 The carousel format allows you to showcase more than one image for a given ad unit so that you can show several images displaying different models wearing your t-shirt and thus making your business trustworthy. ✓ Test advertising one specific product per ad instead of your entire shop – e.g. someone that would buy a t-shirt wouldn’t necessarily buy a tote bag or even interested in seeing tote bag ads. Tailor your target audience specifically to the product in the ad! 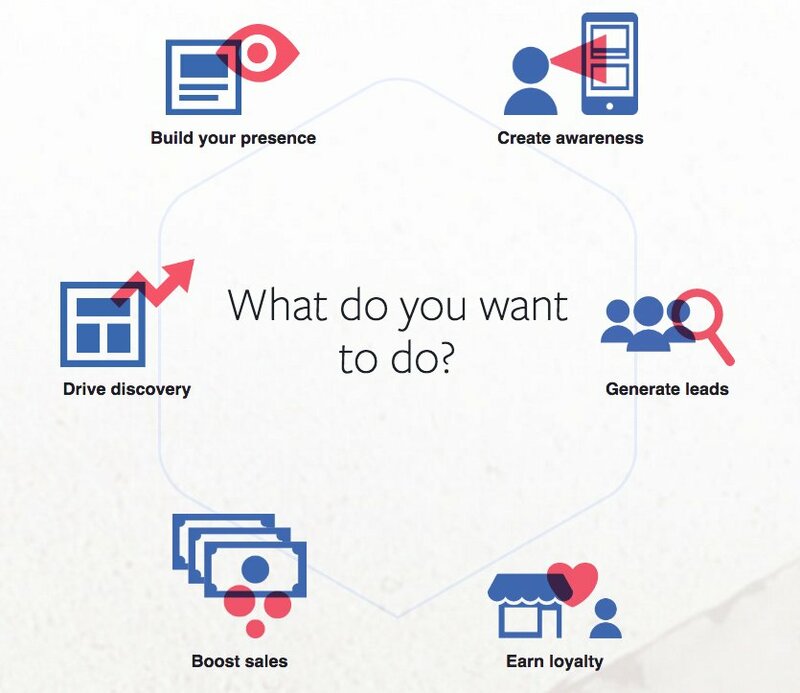 The Facebook Ad Manager makes it easy for everyone to create several ads fast. ✓ It is recommended as well to use videos to promote your t-shirts. It is not difficult to create videos, I repeat, it is not difficult! 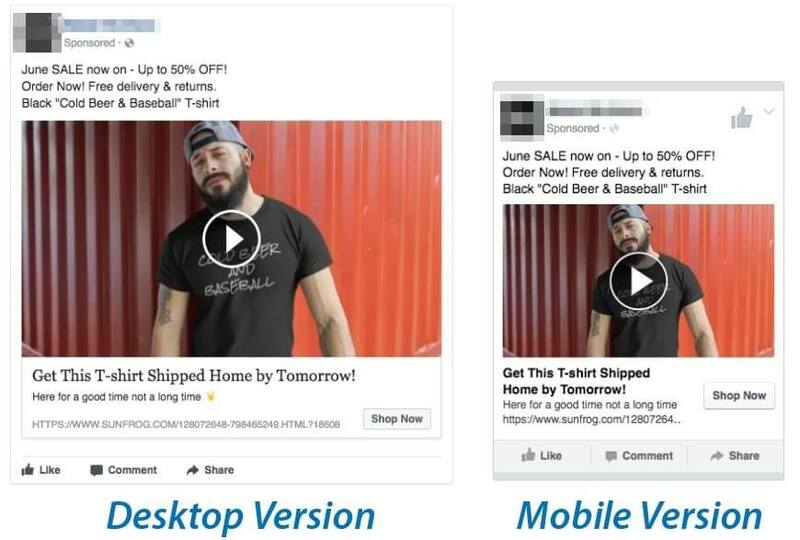 Placeit has t-shirt video mockups and t-shirt cinemagraph mockups that you can use on Facebook Ads. To create a t-shirt video mockup you just have to drag and drop your t-shirt design, that’s it. Facebook has been prioritizing video content for a while now because video tends to generate more engagement. So why not give it a go? Make Your T-Shirt Video Mockup! ✓ Don’t always sell, sell, sell. Share and boost inspiring content that your target audience will find interesting, attractive, or entertaining and build awareness. If you sell cat shirts, share cat content. By doing this you will get your target audience more familiarized with your brand’s values and will find more value in your page. After a few of these posts, users will be more ready to engage with your selling ads. A great way to make your audience identify with your brand effectively is by creating a custom logo for your apparel brand. ✓ Make your ad highly clickable by adding urgency wording. Entice customers with words like “limited time, hurry, last chance” that help create excitement about an offer and pushes users to make the purchase in that exact moment or at the most on that day. Also, use active verbs in your copy and make sure that your customers’ “pain points” are central to your messaging while appealing to emotions. ✓ Don’t assume, test! Create different ad sets that have small changes. Test a different copy, a different image (real person vs an illustration), different demographics, different objectives, etc. By testing different content and variables you will learn which kind of ad your audience feels like engaging the most with and your costs will go down. ✓ Include strong, recognizable trust signals. Fast shipping and returns, t-shirt’s real price, amount of t-shirts already sold, etc. Once your ads start to be effective, the cost per engagement goes down, so work on perfecting your ads! I’m going to show you now a step-by-step guide to follow and create Facebook T-shirt Ads and skyrocket sales. ✓ The URL where you want to send your audience once they engage with your ad. 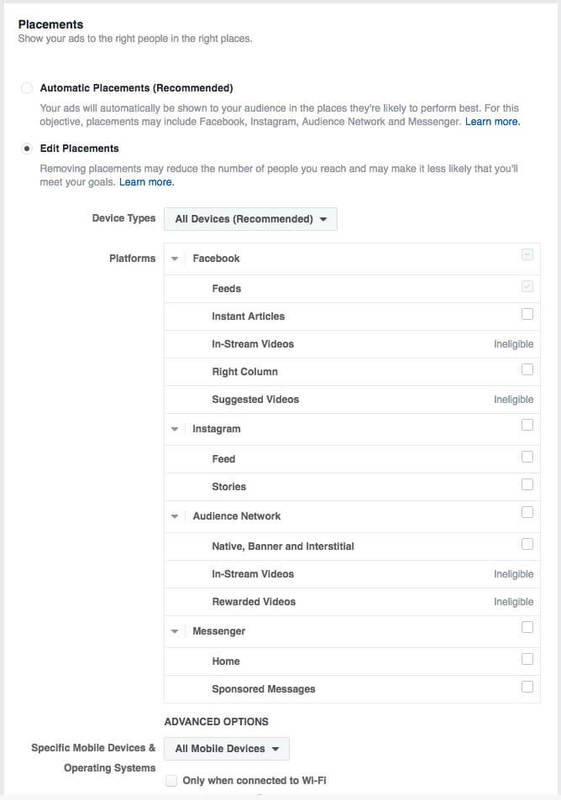 Head to the Facebook Ads Manager screen and start a new ad. Step 1: Choose your Marketing Objective. Choose traffic as your marketing objective. By choosing this option you will be able to send people directly to your shop or product page which is what we want. Step 2: Creating an Ad Account. In this step, you will enter your account and billing information. Choose the country where you are located, currency, and time zone. Here is where your customer buyer persona will come in handy. 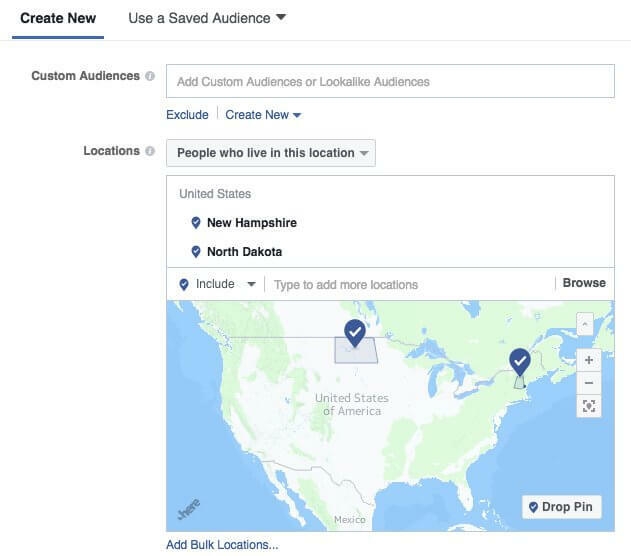 By defining an audience for your ads you will let Facebook know who you want to see your ads and sell your t-shirts to. By knowing the characteristics of the person that is more likely to engage with our ad you will benefit in two ways; first, Facebook will reduce your ads’ cost because the more accurately targeted your ads are, the more the user will be pleased, or not bothered at least, and a positive experience will be delivered which is what Facebook wants. Second, the people who click your ads will be more likely to convert (make the purchase) and you will see a real monetary benefit from advertising t-shirts on Facebook. Now on location, select “People who live in this location.” This option allows you to enter one or more global regions, countries, states/regions, cities, postal codes, addresses to show or exclude your ad to people in those locations. For illustration purposes, I chose to target the states of North Dakota and New Hampshire because according to this report, these two states are where people consume the most beer in the United States and the t-shirts that I will be selling this time are meant to appeal people from 25 to 54 years old, which is the core beer-drinking demographics. Now. Choose the age range and gender of the people who will most likely wear your t-shirts. Then on Languages, choose the language your ad is displayed in. In this guide’s case, English (ALL) will do the job. My ideal customer is most likely to have liked the Budweiser page on Facebook AND enjoy Baseball so that’s what I typed in. Going for intersections like I just did, helps to narrow down the audience and laser targeting your audience. 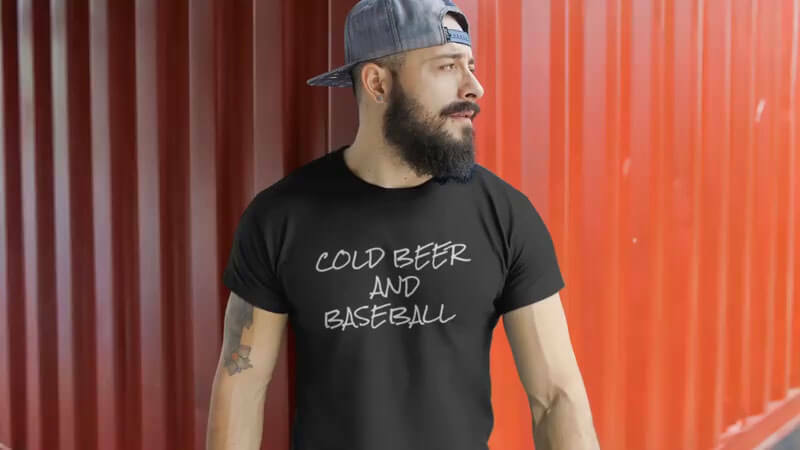 Because a person that liked Budweiser might not be necessarily interested in Baseball, targeting an audience who likes Budweiser OR enjoys Baseball might end up displaying my ads to the wrong people. Don’t forget, these are variables in the advertising equation which can always be optimized in the future. Under the Connections section, you can choose to “Exclude people who like your Page” to deliver your ads only to new users. This is an optional step, you might choose to leave this blank or to target only your current Page followers, just don’t forget to tailor your ad’s image accordingly. Here you will be able to define where will people see your t-shirt ads. Choose to edit placements, deselect everything and select only to show your ads on user’s News Feeds (both mobile and desktop) and on the Right column on the desktop. These are my recommended settings, but you are encouraged to prove me wrong. Personally, I believe that the audience I’m targeting will rarely be on Instagram nor would engage with an ad featured on Facebook’s Audience Network nor on an Instant Article, reason why I deselected them. Here you will define how much you’d like to spend, and when you’d like your ads to appear. Start with low quantities first, the minimum is $10.00 USD, to test the effectiveness of your ads. You don’t want to go and invest $500.00 USD when you haven’t tested your ads yet, right? Remember that running tests is super important when advertising shirts on Facebook. 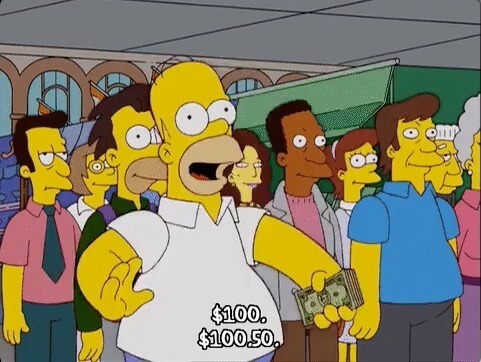 By setting the daily budget to $10 USD and the ad to run for 7 days, you will be able to learn, gather data, and most likely, see how t-shirts sales go up during these 7 days. Now click on Show Advanced Options and let’s tell Facebook that we only want to get charged when a user actually clicks on our ad. This is super important, choosing to be charged by impressions just works if your goal is to boost brand awareness, but this is not our case, on this occasion we want CLICKS & SALES! 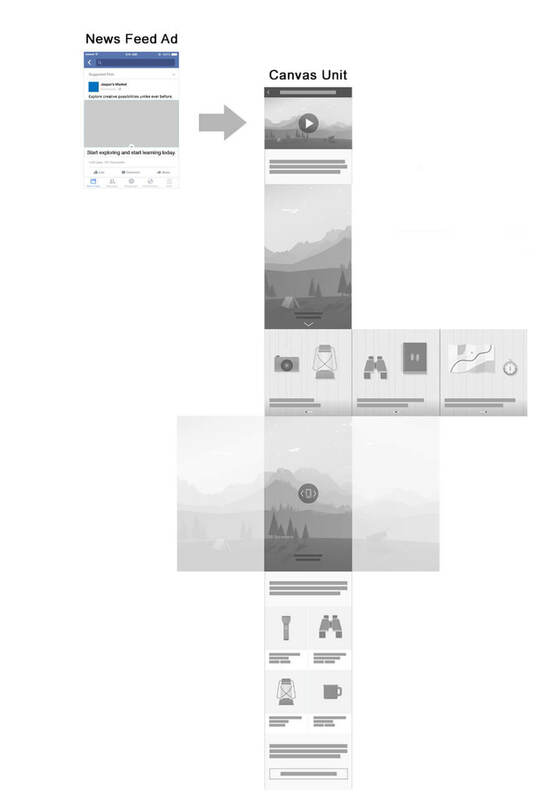 Once you are done, you will see a summarized version of your ad on the right side. Your audience definition “meter” should fall as much as possible towards the left side. Don’t forget, the more specific your selected audience is, the more effective your t-shirt Facebook ads will be. In my case, the potential reach of my ads is 12,000 people as can be seen on the next screenshot. Remember that having a very well defined audience will allow you to spend less in t-shirts ads and sell way more t-shirts. 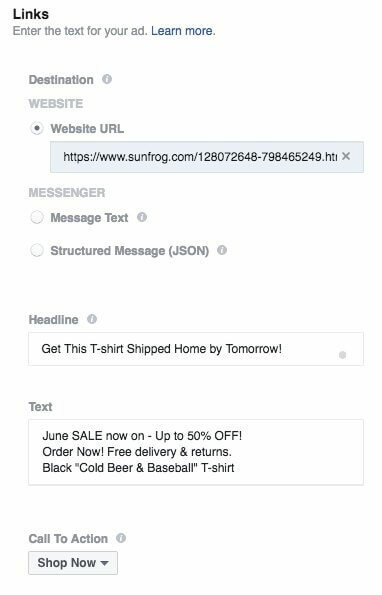 On this Ad Creation section, you will be able to add text and media to your t-shirt Facebook ad. Select the Facebook page that your ads are related to. Facebook has moved to a “video first” strategy. We all love video and Facebook knows it, besides, video content is able to keep users engaged in the platform for a longer time which is beneficial for Facebook as well. Knowing this, promoting your t-shirt with a video is a must so go ahead and choose the “Single Video” format. How to get a professional t-shirt video mockup for less? In case you don’t already have a video to promote your t-shirt, the easiest way to get a professional t-shirt video mockup done is with Placeit. In Placeit’s site, choose a t-shirt video template, I used this one for my ad, then simply upload your t-shirt design, here’s mine, and that’s it! Download your high definition MP4 t-shirt video and upload it. See how cool this t-shirt video mockup looks! Now select your Facebook Page and copy and paste the URL where you want to send people to. It is time now to get creative with compelling copy that will talk to your audience and will help convince users of clicking or tapping on your ad. Since I’m selling a t-shirt, the call to action should say “Shop Now” because I want users to go to Sunfrog in this case and purchase my t-shirt. 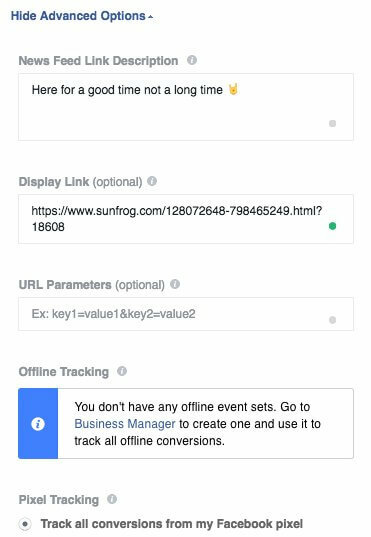 Now under Advanced Options, add supporting copy and a short display link that will tell your audience where they will be taken to, in this case, to Sunfrog. Your T-shirt Facebook Ad is now ready! Hit the “Place Order” green button at the bottom right corner and you will be good to go. This is the final result of my ad and it is a great looking one. Too easy wasn’t it? Your ad now shows a t-shirt video featuring your design being worn by your target audience and it looks awesome wearing this t-shirt proudly! What if I want to advertise my t-shirts with images rather than with a video? 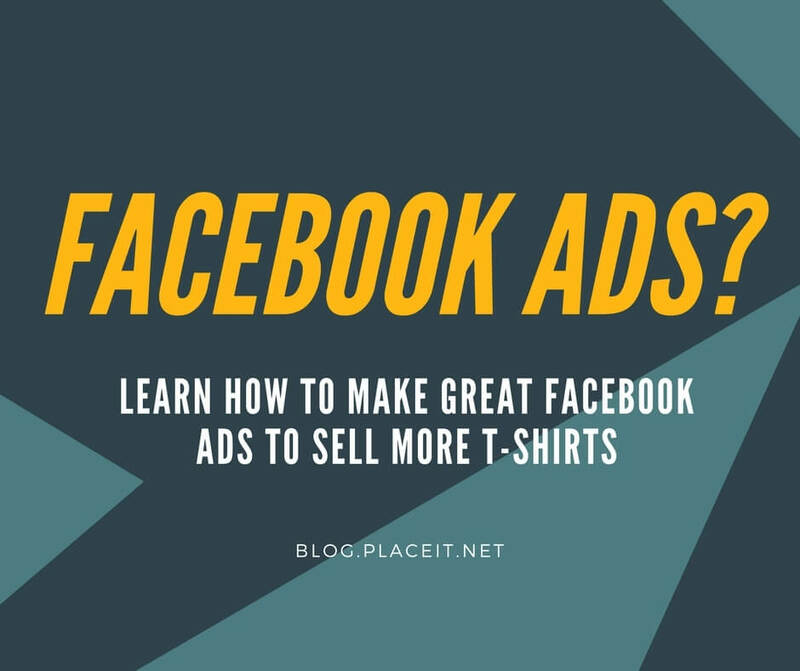 If you use want to use an image to create T-shirt Facebook Ad, I recommend you as well to use Placeit for the best results. I’ll show you why. First, go and select “Single Image” ad format. As I was saying Placeit will help you to create an eye-catching Facebook T-shirt ad. So once in Placeit’s site, choose a Facebook Ad Image Template, customize it your own way and download your high definition image file so that you can upload it to the Facebook Ads Manager. 1. 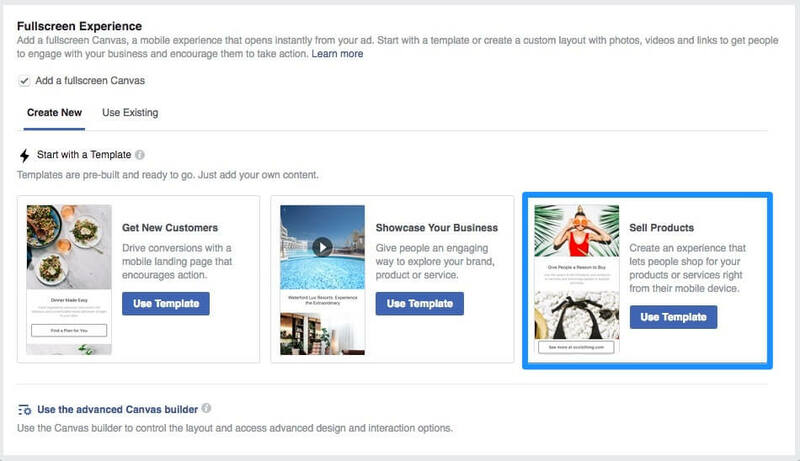 Choose a Facebook Ad Template. 2. Upload your T-shirt design in PNG or JPEG format. 3. Choose the T-shirt color that matches the actual T-shirt that you are selling. 4. Fill in the blanks with your promotion’s details. 5. Hit download and upload your new ad image to the Facebook Ads Manager. Your ad now shows a t-shirt being worn by your target audience! See how cool this Facebook T-shirt Ad Image looks! Create A Facebook Tshirt Ad Image Now! What About This Facebook Ad Format Called “Carousel”? Should I Use It? Yes! The Carousel ad format seems complicated at first glance but it really isn’t. The Carousel ad format combined with the Canvas feature allows users to browse and purchase your offerings in a beautiful visual way. It will help you acquire more new customers, drive awareness and generate sales since you are able to include both a video and photos to your add to make it irresistible! I’ll quickly show you how to make the best out of the already available full-screen templates that prospects will be happy to click through. 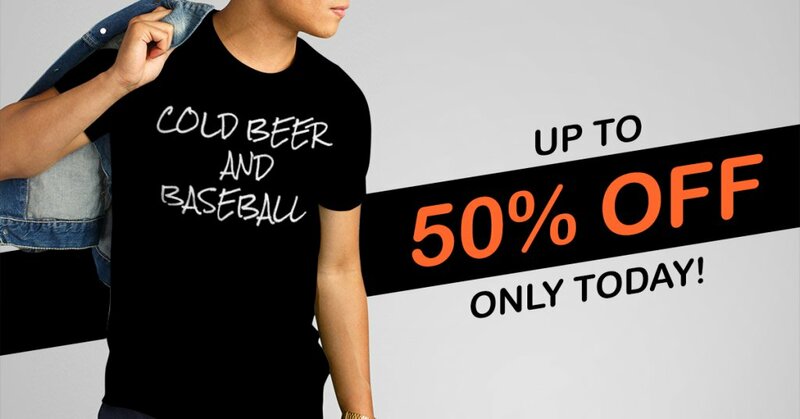 Go ahead and choose the Carousel ad format to promote your tees. Now click on the Add a fullscreen Canvas option so that the following screen appears. You will now select the Sell Products options. The following image can explain what you can do with the Canvas feature enabled. It’s a super creative method to tell your t-shirt business story! But to start with, let’s use the ready-to-edit template from Facebook. Here you will be able to add a t-shirt video mockup and from four to 50 items so people can browse and shop. Upload an image and add a headline for each image, a description and destination URL for each item. At the very bottom, you will want to add a strong call-to-action to make users pull out their credit cards and purchase your awesome t-shirts! ✓ Simple to create with templates or advanced Canvas builder for custom Canvases that will help you to tell the story about your brand in a short and powerful way. ✓ Loads instantly and allows you to amaze customers thanks to the fullscreen experience. Since the Canvas interface is thought to improve the mobile experience, you will also need to create t-shirt ads with the same information for the rest of the devices as seen in the following screen. Now have a sneak preview of what your users will be experiencing once they stop scrolling down and stop and click on your ad! 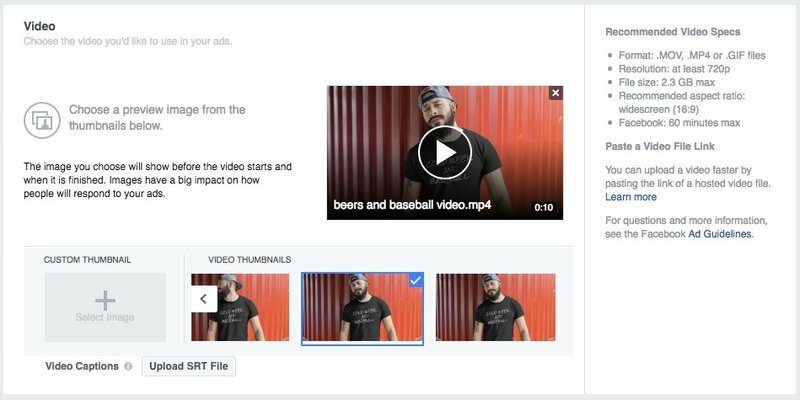 If you prefer to watch someone make a Facebook ad here’s a step-by-step tutorial we prepared for you. Create Imagery for Your Ads Now! Effectively configuring Facebook Ads is not as difficult as it seemed in the beginning after all. Continue experimenting and see what works best for you and your audience. In the end, Facebook Ads is where the best business owners advertise. Want to take it all one step further? Consider creating your own business cards to boost your image. By following these practical steps and using t-shirt mockups you can transmit much more that by simply showing a t-shirt with a white background. 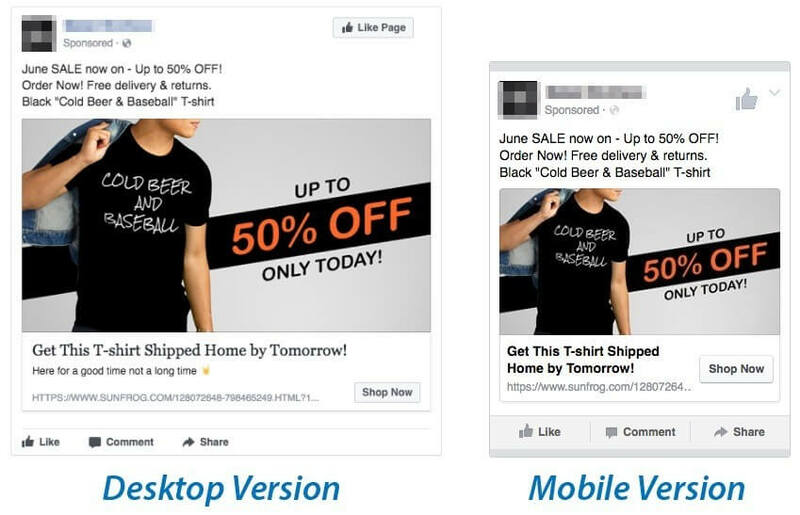 Placeit has thousands of mockups with the right Facebook Ad Image dimensions ready to be used by you. Dozens of mockups are added every single day so be sure to visit often. It’s also worth mentioning that Placeit has some great ad templates that you can use to design eye-catching advertisemetns not only for Facebook, but also for other social media websites, your online shop, or even to include in your newsletter. You can find all sorts of ad templates for seasonal sales, like Black Friday ads or Christmas ads. But don’t stop there, Placeit also has hundreds of amazing templates for your Instagram Posts and your Instagram Stories. Pro tip – Placeit has an unlimited subscription that gives you access to every last t-shirt mockup and facebook ad template. This way you can feel free to experiment with all types of different mockups and figure out which ones work best with your niche without breaking the bank, so be sure to sign up! What’s best is that you don’t need any photo or video editing experience at all, all the editing is done for you so that you can simply upload your artwork and forget about the rest. In case you need a t-shirt design inspiration you should check this free 2018 T-shirt Calendar we just released. What are your thoughts? Any insight you’d like to share on what has and hasn’t worked for you? Leave a comment and let’s start a conversation! Ready to Create T-Shirt Mockups to Better Promote Your Brand? Create A Tshirt Mockup Now! Feeling Christmassy yet? You can also get the word out on your brand with beautiful Christmas online banners! Follow our Facebook ads guide to reach thousands of potential customers with your fantastic t-shirt designs. Facebook ads aren't as complicated as they might first seem, in this quick guide we show you the ins and outs of creating an ad campaign that will help your brand grow and potentially make quite a bit of money! Placeit has loads of amazing t-shirt mockups, you can use to give you the edge over the competition and in this guide we show you how to use them. "Great stuff! I just sold my first t-shirt from the Facebook ad I made with Placeit!" 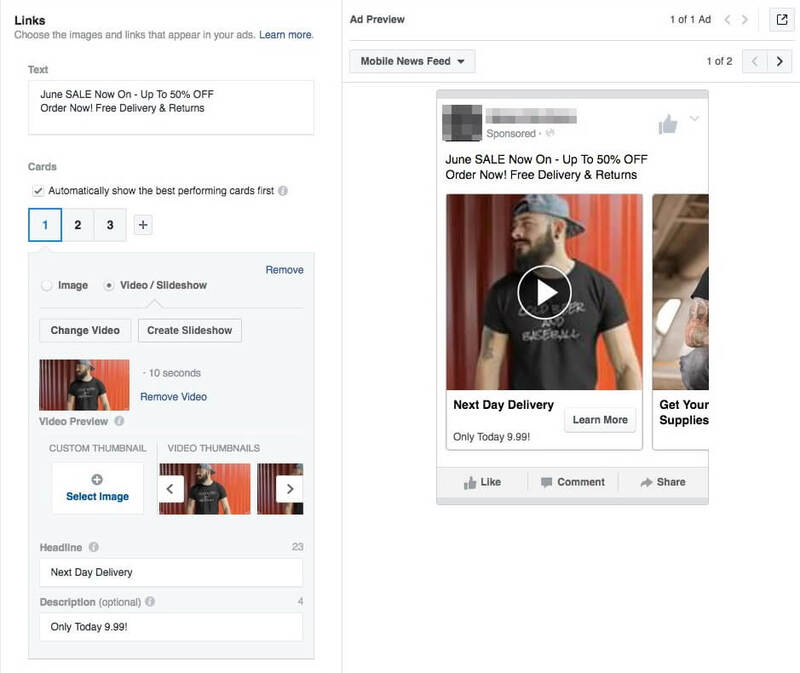 Video ads are killing it on facebook and if you're not using them yet, you need to step up your game with Placeit's Video mockups! In under a minute, you can have incredible t-shirt mockups that get people to stop scrolling and start paying attention! Don't let the competition get ahead of you! If you already sell t-shirts online, adding more products to your apparel line is a great idea! With summer just around the corner, why not sell custom crop tops online? Design amazing Facebook Covers with Placeit's Social Media Image Maker tool in just a few steps! Placeit is very easy to use and you will get a beautiful right sized cover picture in high resolution to improve your social media marketing efforts effectively. Create awesome posts for any social media network with Placeit's Social Media Graphics in less than 5 minutes!